Online Application Form for TS Teachers Transfers 2018 Online Apply @ cdse.telangana.gov.in. Telangana Teachers Transfers Online application form has been placed in the website http://cdse.telangana.gov.in. How to fill the Transfer Application form Online Application Form for TS Teachers Transfers 2018, TS Teachers Transfers 2018 Online Application Form for Transfers Web Counselling Instructions Download as per GO 16. Telangana Teachers Transfers schedules/web options/Online application dates, TS Teachers Transfers Schedule/ web options/ web counselling dates. 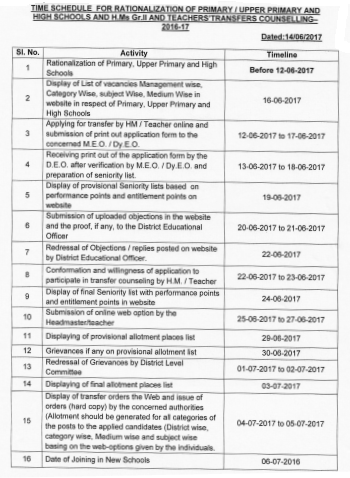 TS Teacher Transfers Online Apply at cdse.telangana.gov.in. Online Application Form, Web options Guidelines, web counselling Rules, Transfers declaration Certificates and Points Calculation software Download.